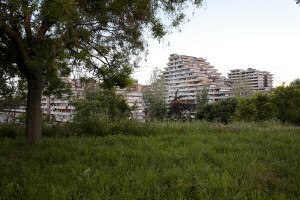 Scampia is a neighborhood in the northern area of Naples, that after the period of the long and bloody Camorra feuds is finally reborn thanks to the will of the people who inhabit it. In recent years over than one hundred associations were born, numerous public spaces were recovered and many children at risk saved through sport. Numbers of no small importance for a neighborhood of about forty thousand inhabitants and considered among the most difficult ones on the Italian territory. 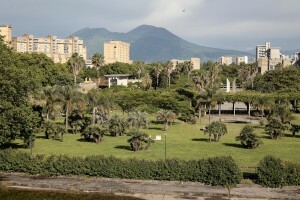 May 20, 2016 – Naples, Italy: The so called “Vele” palaces of Scampia are seen from an hill of the public garden of Secondigliano district. February 24, 2016 – Naples, Italy: A child plays during a lesson of circus disciplines, a social project held by teachers Maria Teresa Cesaroni and Jack Sanchez Mc Guirk aimed at young people at risk living in Scampia district inside “Officina delle Culture”. “Officina delle culture” is a multi-purpose center born in the Neapolitan neighborhood of Scampia and dedicated to Gelsomina Verde, an innocent victim of Camorra. The site is run by the association “Resistenza Anticamorra” and its objective is to offer concrete alternatives to children at risk but also to prisoners who have no restrictive measures. March 2, 2016 – Naples, Italy: A portrait of Rafael Jack Sanchez Mc Guirk, teacher of circus discipline applied to social circus. The Foundation “Tree of Life” in Milan has funded a circus project for young people at risk in Scampia district. May 4, 2016 – Naples, Italy: The teacher Antonio Friullo during an after-school lesson organized by “NonUnodiMeno” association inside Santa Maria della Speranza church in Scampia. The aim of the association is to promote the integration of different ethnic groups, involving in educational activities both at-risk kids of the district and Roma children. 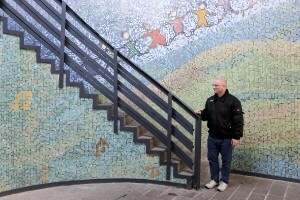 February 24, 2016 – Naples, Italy: A portrait of Walter Bottaccio, priest of the church Santa Maria della Speranza in Scampia district.”Officina della culture” is a multi-purpose center born in the Neapolitan neighborhood of Scampia and dedicated to Gelsomina Verde, an innocent victim of Camorra. The site is run by the association “Resistenza Anticamorra” and its objective is to offer concrete alternatives to children at risk but also to prisoners who have no restrictive measures. The “Officina delle Culture” is located in a former school who in the past eight years has been first used by the mafia to hide their weapons and then as abusive hospitalization for addicts. 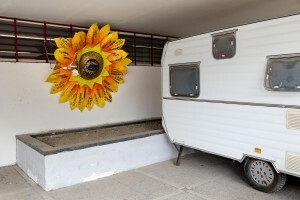 February 24, 2016 – Naples, Italy: A paper sunflower close to the entry of “Officina delle Culture”. On each of the sunflower petal is marked the name of one of the green areas recovered by the association “Volontari per Napoli” in Scampia district. “Officina delle culture” is a multi-purpose center born in the Neapolitan neighborhood of Scampia and dedicated to Gelsomina Verde, an innocent victim of Camorra. The site is run by the association “Resistenza Anticamorra” and its objective is to offer concrete alternatives to children at risk but also to prisoners who have no restrictive measures. February 24, 2016 – Naples, Italy – The free dance course taught by maestro Patrizio Liguori from the cultural association “Raggio di sole per Scampia” addressed to the children of prisoners and at-risk boys inside “Officina delle Culture”. “Officina della culture” is a multi-purpose center born in the Neapolitan neighborhood of Scampia and dedicated to Gelsomina Verde, an innocent victim of Camorra. The site is run by the association “Resistenza Anticamorra” and its objective is to offer concrete alternatives to children at risk but also to prisoners who have no restrictive measures. April 14, 2016 – Naples, Italy: Women at work in the Hurtado center, an association who operates in Scampia and whose objective is the social integration of disadvantaged people by carrying out activities aimed to providing employment. The sewing workshop was established in 2004, within the Social Cooperative “La Roccia” and in addition to the transfer of specific skills is designed to offer a peaceful growth in the values of the culture of work and legality. May 4, 2016 – Naples, Italy: Backstage of Tg Made in Scampia News inside TV Campane studio, the issuer who has decided to host the TG news in Melito, southern Italian city of Naples. The TG News, designed by Rosario Esposito La Rossa and Nunzio Marigliano and presented by Maddalena Stornaiuolo is a real independent start-up with the aim of telling the good news of Scampia district, those often without eliciting the interest of large national and foreign media: the cultural ferment, the resistance to the Camorra of people who believe in honesty, young boys and girls who have found their way in the sport, associations, theater, etc. All the TG staff work on a voluntary basis. May 4, 2016 – Naples, Italy: Staff of Tg Made in Scampia News inside TV Campane studio. The TG News, designed by Rosario Esposito La Rossa and Nunzio Marigliano and presented by Maddalena Stornaiuolo is a real independent start-up with the aim of telling the good news of Scampia district, those often without eliciting the interest of large national and foreign media: the cultural ferment, the resistance to the Camorra of people who believe in honesty, young boys and girls who have found their way in the sport, associations, theater, etc. All the TG staff work on a voluntary basis. 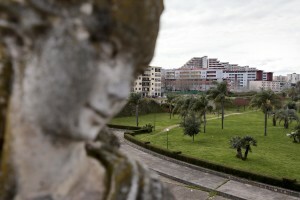 March 13, 2016 – Naples, Italy – A general view of the “Vele” palaces of Scampia and public garden in Secondigliano district. March 13, 2016 – Naples, Italy – Gypsy women at work inside the kitchen of Chikù restaurant in Scampia, Secondigliano district. Chikù is the first Italian-Romanian restaurant, where the Neapolitan and Balkans cuisine merge in a common size. Besides being a gastronomic space, the Chikù restaurant is a place of integration and pedagogical experimentation dedicated to children, families, young people, students, workers, and to anyone who wants to meet and communicate, have fun and socialize. 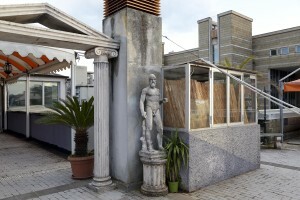 March 7, 2016 – Naples, Italy – A statue is seen on the terrace of Chikù restaurant in Scampia, Secondigliano district. April 14, 2016 – Naples, Italy: Workout at Arci Scampia soccer school in Scampia district. The Football School is a non-profit company born in 1986 that since its establishment has always been sensitive to social problems of Scampia neighbourhood, acting as a reference point to protect children at risk. April 14, 2016 – Naples, Italy: A child after a workout at Arci Scampia soccer school in Scampia district. 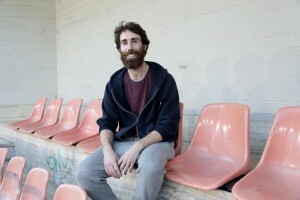 The Football School is a non-profit company born in 1986 that since its establishment has always been sensitive to social problems of Scampia neighbourhood, acting as a reference point to protect children at risk. June 8, 2016 – Naples, Italy: The member of the association “Pollici Verdi” Marco Alfieri cuts the grass of “Corto Maltese” park in Scampia district. Since three years a group of citizens called “Pollici Verdi” take care of “Corto Maltese” pak and self-tax with about 10 euro per month each, with the goal of saving the municipal gardens from degradation. 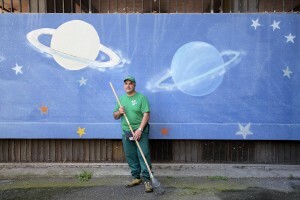 June 8, 2016 – Naples, Italy: The member of the association “Pollici Verdi” Vincenzo Sorrentino is portrayed near a mural inside “Corto Maltese” park in Scampia district. Since three years a group of citizens called “Pollici Verdi” take care of “Corto Maltese” pak and self-tax with about 10 euro per month each, with the goal of saving the municipal gardens from degradation. May 17, 2016 – Naples, Italy: Athletes during warm up before swimming workouts at the pool Massimo Galante in Scampia district. Massimo Galante swimming pool founded in 2013 has quickly become a reference point for young people who believe in the sport and is already getting major trophies, like the silver medal won by Giulio Iaccarino, 16 years old, at the Italian championships. May 17, 2016 – Naples, Italy: An athlete during swimming workouts at the pool Massimo Galante in Scampia district. Massimo Galante swimming pool founded in 2013 has quickly become a reference point for young people who believe in the sport and is already getting major trophies, like the silver medal won by Giulio Iaccarino, 16 years old, at the Italian championships. May 7, 2016 – Naples, Italy: People before the singing auditions “Cometincanto” inside the “Fabrizio De André” auditorium of Scampia district. The song award, which has the aim of promoting the new generation of singers and musicians will end next October 15, 2016 in Città della Scienza, one of the most significant cultural centers of southern Italy. 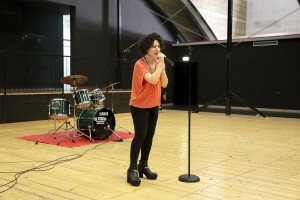 May 7, 2016 – Naples, Italy: Daniela Benitozzi performs during the singing auditions “Cometincanto” inside the “Fabrizio De André” auditorium of Scampia district. The song award, which has the aim of promoting the new generation of singers and musicians will end next October 15, 2016 in Città della Scienza, one of the most significant cultural centers of southern Italy. March 7, 2016 – Naples, Italy: A moment of theatrical workshop of Arrevuoto group at Chikù restaurant. Arrevuoto is a theater and pedagogy project created in 2005 by the will of the Teatro Stabile of Naples and operates between the suburbs and downtown of Naples. The project involves young people at risk and boys and girls from different social classes. 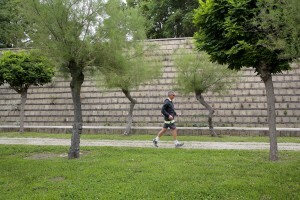 May 29, 2016 – Naples, Italy: A man runs inside the Scampia public garden in Secondigliano district. March 10, 2016 – Naples, Italy – A portrait of the publisher Rosario Esposito La Rossa in his office housed in the multifunctional center of Scampia district. Marotta and Cafiero is an independent publishing house born in 1959 and after 50 years under the guidance of Marotta family has been donated to Rosario Esposito La Rossa and Maddalena Stornaiuolo along with about twenty thousand books. 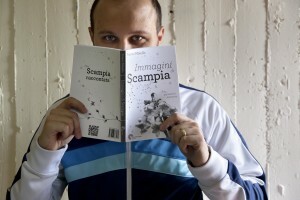 Marotta and Cafiero deals with social narrative with particular reference to the city of Naples and is the first example of youthful enterprise in Scampia. March 1, 2016 – Naples, Italy: Judo training inside the Star Judo gym in Scampia. The Star Judo gym, through martial arts, has become a reference point for the fight against Camorra, saving many children at risk of the district. 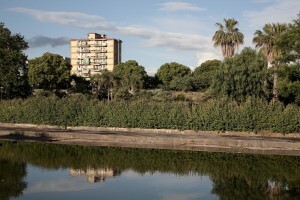 May 20, 2016 – Naples, Italy: A general view of Scampia public garden in Secondigliano district. 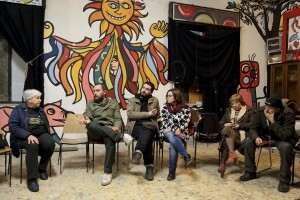 February 19, 2016 – Naples, Italy: An organizational meeting inside Gridas headquarters in Scampia district. Gridas is a cultural non-profit organization founded in 1981 by Felice Pignataro, Mirella La Magna and Franco Vicario gathered by the common intent to put their artistic and cultural skills to the service of common people to stimulate an awakening of consciences and active participation in the growth of the society. June 8, 2016 – Naples, Italy: President of the association “Pollici Verdi” Giuseppina Di Natale is portrayed in her home inside “Corto Maltese” park in Scampia district. Since three years a group of citizens called “Pollici Verdi” take care of “Corto Maltese” pak and self-tax with about 10 euro per month each, with the goal of saving the municipal gardens from degradation. Migrants coming mainly from Mali, Gambia and Nigeria play football with Italian boys during the national event “Antiracist Mediterranean” in Scampia district, near Naples on May 13, 2016. “Antiracist Mediterranean” has the aim to break down the barriers and constructs rights thanks to the sports instrument and culture. 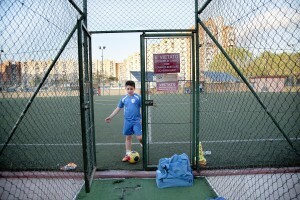 April 14, 2016 – Naples, Italy: A child is seen outside the Arci Scampia soccer school in Scampia district. The Football School is a non-profit company born in 1986 that since its establishment has always been sensitive to social problems of Scampia neighbourhood, acting as a reference point to protect children at risk. 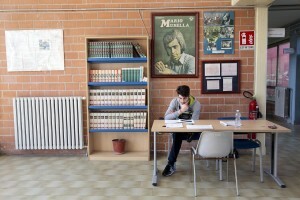 March 2, 2016 – Naples, Italy: A student is seen inside the municipal public library “Domenico Severino” in Scampia. 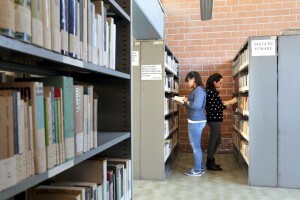 March 2, 2016 – Naples, Italy: Schoolgirls consult books inside the municipal public library “Domenico Severino” in Scampia. 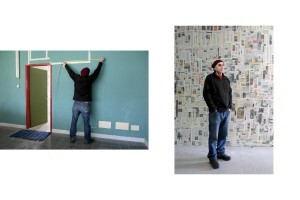 February 24, 2016 – Naples, Italy: A portrait of Sergio Denza responsible for the information point on psychosocial rehabilitation inside “Officina delle Culture” in Scampia.”Officina delle culture” is a multi-purpose center born in the Neapolitan neighborhood of Scampia and dedicated to Gelsomina Verde, an innocent victim of Camorra. The site is run by the association “Resistenza Anticamorra” and its objective is to offer concrete alternatives to children at risk but also to prisoners who have no restrictive measures. 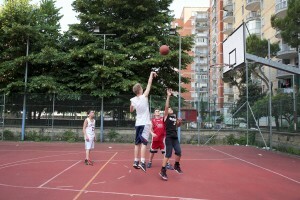 June 8, 2016 – Naples, Italy: Boys playing basketball inside “Corto Maltese” park in Scampia district. Since three years a group of citizens called “Pollici Verdi” take care of “Corto Maltese” pak and self-tax with about 10 euro per month each, with the goal of saving the municipal gardens from degradation. 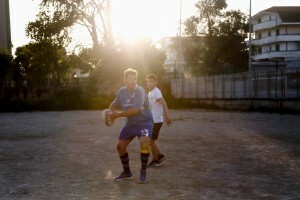 May 24, 2016 – Naples, Italy: Players of “Scampia rugby” are seen during a training session at the stadium made available by Regina Mundi church in Secondigliano district. “Scampia rugby” born in 2013 and today partecipates in the C2 regional championship. May 3, 2016 – Naples, Italy: A portrait of the writer Gianluca Raro know as “Raro” in Scampia district. 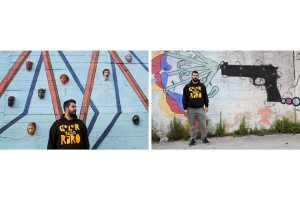 Raro through his murals is embellishing many areas of the Scampia neighborhood best known for degradation and crime. May 20, 2016 – Naples, Italy: A man is seen inside Scampia public garden in Secondigliano district. May 25, 2016 – Naples, Italy: Players of “Athena volley” are seen during a training session at “Ilaria Alpi-Carlo Levi” stadium in Secondigliano district. “Athena volley” was founded in 2009 and today partecipates in the first division Italian championship. March 13, 2016 – Naples, Italy – A poster depicting the “Vele” palaces of Scampia and a puppet are seen inside Chikù restaurant in Scampia, Secondigliano district.